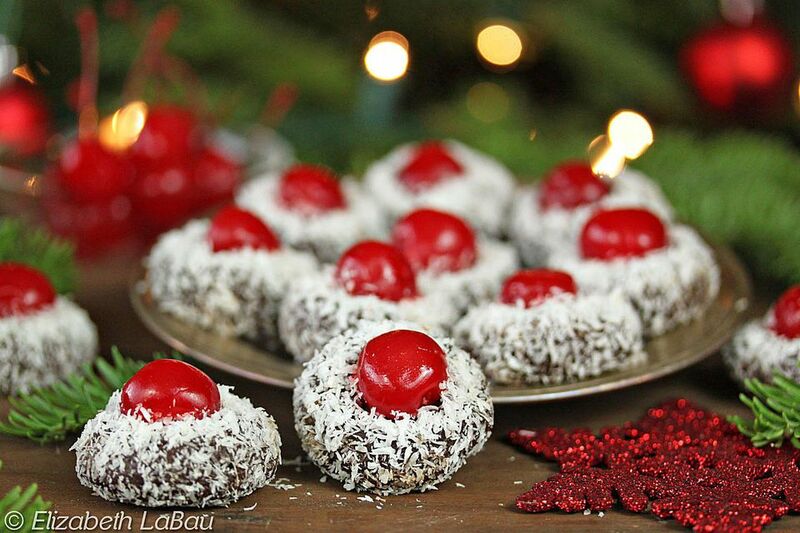 Reindeer Noses are actually delicious chocolate fudge balls topped with candied cherries and rolled in coconut. These stunning candies are eye-catching and make a perfect holiday party treat. If you can't find finely shredded coconut, pulse your coconut in a food processor or blender for a few seconds; this makes it easier for rolling candies, and it makes the rolled candies more visually appealing. Place both chocolates, the butter, and the cream in a large microwave-safe bowl. Microwave until the chocolate is melted, stirring after every 45 seconds to prevent overheating. (Alternately, you can melt the mixture on the stovetop over a double boiler). Once the chocolate is melted, stir until the mixture is smooth. Sift the powdered sugar over the bowl and stir until well-combined. Chill until the mixture is firm enough to shape, about 1 hour. Using a teaspoon, scoop up small amounts of the candy and roll them into small balls between your palms. Press a candied cherry into the top of each ball, inserting it enough so that it is secure but still protrudes from the top. Place the shredded coconut in a bowl. Roll the sides of the fudge balls in the coconut, so that it sticks to the chocolate but does not cover the cherry. If the chocolate is very dry and the coconut does not stick, try dampening your hands slightly and holding the candy with one hand while pressing the coconut onto the candy with the other. The water from your hands will help the coconut stick in an even coating. Repeat with remaining candies until all are covered with coconut. Store the candies in an airtight container in the refrigerator for up to a week, and allow to come to room temperature before serving.